New Spencer and Christy data. Global temperature trend since Nov. 16, 1978: +0.12 C per decade. UAH is reprocessing the complete global temperature dataset to include a new correction, according to Dr. John Christy, director of the Earth System Science Center (ESSC) at The University of Alabama in Huntsville. "The April and May 2005 results include that new correction," Christy said. "We expect to have the complete dataset available in time for the June Global Temperature Report." Well, the comments on my article have been closed. 124 posts seems to be a record, so at least it seemed to generate some interest, even if it was more heat than light. Maybe I will have the opportunity to contribute with some of my more mainstream scientific reseach in the future. Although I did post a couple of replies in the comments, I tried to avoid getting drawn into answering every minor detail there, as the blog format doesn't really lend itself to sensible multi-party debate. Instead, here's a summary of some of the points raised. Firstly, I've still not found a sceptic who is prepared to bet against continued warming at the IPCC-predicted 0.15C/decade. Chip Knappenburger explicitly endorsed it, which was quite a contrast with his recent email bluster about how the recent warming was anomalous and liable to be reversed (in connection with this blog post). Neither he nor anyone else could come up with any concrete examples of the alarmism that supposedly infests mainstream climate science. I don't think Joel Kuni's idea quite adds up in the form he presented it, but certainly a long term prediction designed to test the climate science would have to be conditional on GHGs. There are standard approaches to this sort of issue, so it is not an insurmountable problem. As far as the correlation between GHGs and temperature goes, recent history already passes his r2>0.5 test with flying colours - the Mauna Loa CO2 data vs GISTEMP from 1961-2004 gets r2=0.76, and I'm sure that the Vostok ice core data must be in the same ballpark over ~400,000 years or more (a quick google finds multiple references to the strong correlation but no hard numbers and I can't be bothered doing it myself). 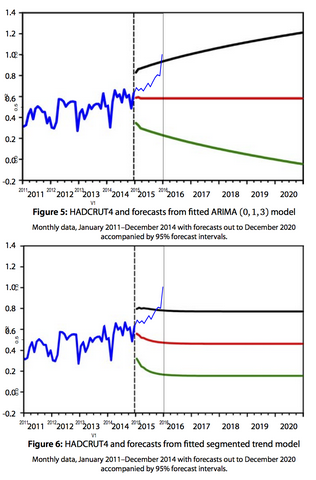 Mark Bahner keeps on ranting about how the IPCC "predictions" for GHGs are wrong. He seems to confuse the TAR with a paper by Wigley and Raper which appeared around the same time. (His error must be deliberate misrepresentation, since I've pointed out this mistake several times. At least Chip Knappendale had the honesty to admit his mistake when I called him on the same trick.) W&R make the assumption that the SRES scenarios define a probabilistic distribution of future emissions in the absence of regulatory action, but the IPCC does not. I have no problem with W&R making that assumption if they think it is appropriate, but it is clearly their own assumption, explicitly disowned in the SRES. In any case, since some sort of political action is well-nigh inevitable, W&R's premise will be falsified and their "prediction" will not be applicable to the real world. It's a "what would happen if we take no action", not a "this is what we think will happen". The situation is rather different from forecasting the weather, in that we actually get to choose (at least, influence) the direction that society takes. Last, and least, the "junkscience bet". I'm disappointed that anyone would be taken in by this sort of nonsense, since it was patently obvious that Milloy was looking for excuses rather than a deal right from the outset. For starters, he props up the tired old straw man of the "median IPCC estimate"of 1C warming from 1990 to 2025 (which is only to be found in his imagination, not the IPCC TAR itself). Then he brings up the classic red herring of errors in measuring absolute temperature, which as Gavin noted is irrelevant to the question of temperature anomalies. Then, just in case there is still a chance of a bet, he says that he won't trust the measurements anyway. All he's offered is a bunch of snivelling excuses, but his fans all lap it up anyway. I just hope that at least some of them have the honesty to feel a little sheepish about it. Looks like there is a "War on Science" over in the good ol' US of A.
I hope the scientists who are being harassed in such an offensive manner stick two fingers up to Barton and co. Maybe they should take a lesson from George Galloway's recent appearance (eg see here and here). I suspect that a witch-hunt like this could have serious repercussions for scientific research in the USA, if it is not vigorously rebuffed by the relevant authorities. Certainly it is slipping well down the list of tempting destinations for me when my time in Japan comes to an end. Not that I expect anyone to lose any sleep over my choices, but I won't be alone in my opinions. jules plays this at me occasionally. Can't imagine why she thinks it's relevant. It's the Hitchhiker's Guide to Blogging, read by Stephen Fry. Now having listened to that excerpt, you can buy the whole thing from the iTunes music store. Time to look at another claim on the FX market. This time it's the turn of SLv1, the probability of a 1m rise in sea level by 2030 (compared to 1994, the claim's launch date). This is currently priced at about $0.19, indicating that the market thinks there is a 19% probability of this rapid sea level rise occurring. But what do the experts think? Firstly, there is no way that thermal expansion alone could generate such a rapid rise in sea level. The only mechanism that could hypothetically cause such a rapid rise would be the collapse of a major ice sheet, and the West Antarctic Ice Sheet (WAIS) is the most (only?) credible candidate for that. A quick google quickly found this paper which discusses the subject in depth. The paper estimates the risk of collapse at about the 5% level over the next 200 years - and note that their definition of "collapse" is anything over 1cm sea level rise per year, which is still a long way way short of the 4cm/year required for the claim to come true (in terms of the claim, the post-1994 sea level rise is small enough to ignore). It doesn't take a genius to work out that 1m by 2030 simply isn't going to happen, unless all the scientists have completely overlooked some massive part of the problem. Since these are the same scientists (roughly speaking) who first considered the problem, and without whose investigations the FX claim would never have been set up, it seems more than a little ridiculous that the market traders think the scientists are so badly wrong. Prediction markets have their place in aggregating information, but the only justification for such a high price is that someone somewhere is assuming the existence of a whole new aspect to the problem that has not yet even been proposed (AFAIK). So that makes 3 claims relating to climate change (first two here and here) where the market is substantially more alarmist than the scientific consensus. I'll have more to say about what I think about the causes and implications of this later. In the sparring over the "Betting on Climate Change" debate, one recurring theme has caught my attention - the reference to global warming alarmists who think that rapid warming is likely. For the purposes of this debate, "rapid" and "likely" basically mean more extreme than the IPCC's forecast of 0.1-0.2C/decade in the near future. Ron Bailey knowingly lies in his claim that "people like Annan" expect a temperature rise of 0.3C/decade from now on. Chip Knappenburger wants to bet against the alarmists who expect temperature rise of 0.4/decade or more. This blog article talks about sceptics, realists, and alarmists (and identifies realists with the IPCC position). The question is, do these alarmists really exist? If so, where? Why are there no quotable quotes from them, and names named? Rest assured, I will happily - no, eagerly - offer bets to those who make statements which I believe to be too extreme. But I've not found one yet. Just in case anyone coming here didn't do it via the RealClimate site, my article "Betting on Climate Change" is now published at the above address. I'll reply to comments there, but as Brian Schmidt noticed right away, I wrote 0.3+-0.1C/decade over the next 20 years but of course meant 0.3+-0.1C in total over the next 20 years (eg see here)...so much for proof reading. I hope it doesn't distract too much from the main point, although no doubt the sceptics will pick up on it and try to bet against 0.3C/decade. Ho hum. Oh, I see Chip Knappenburger won't even go that far, but wants a mid-market rate of 0.325C/decade. Some sceptic. To save people having to dredge through my blog and elsewhere for the "betting on climate change" stuff, I'll try to keep this article reasonably up-to-date as a set of links to relevant pages, both my own and those others have written. 24/08/2005 The Bet hits the news-stands, first covered by Jim Giles in Nature and then David Adam in The Guardian. 7/07/2005 Some comments on the RC article and debate, and an update on the Bashkirtsev and Mashnich situation. 18/06/2005 The RealClimate article, plus Pielke and Stoat comments. An introduction, and the Lindzen bet. Pat Michaels and Chip Knappenburger withdraw their previous offer. Myron Ebell (challeged by George Monbiot). Jaworowski disowns the solar cooling forecast. Idso, Kininmonth and Mashnich all refuse to bet. Then Mashnich seems interested...maybe. My first comments on Ron Bailey's article in "Reason". Realclimate.org article, and my comments on the discussion that followed. Bashkirtsev and Mashnich have agreed a bet! Ron Bailey's article in Reason, which in trying to be sceptical oversteps the mark in a few places. It still calls on the sceptics to "put up or shut up" though. A brief mention on Chris Mooney's blog. Brian Schmidt on "Backseat Driving" has comments here and here. He also amended Lindzen's Wikipedia page to mention the non-bet. I even rate a brief mention on William Connolley's world famous mustelid farming site, in particular here, here and here (oh, and my real work too). Roger Pielke Jr. has this article on his blog. He also wrote this article a few years ago, which talks about prediction markets more generally. The Nature article that broke the story of my bet with Bashkirtsev and Mashnich. An article in The Guardian followed the next day. It's been mentioned in several blogs, including Slashdot, Deltoid, Marginal Revolution, Educated Guesswork, Technology Review, Reason, Backseat Driving. I've also got a bet with Joe Romm related to sea ice. And another on nearer-term temperature change with David Whitehouse. This story has now popped up again in "Reason", which is where it all started. The article is not too unreasonable (given its location), but it tries to take a sceptic viewpoint which results in it overstepping the mark in a few places. It's particularly disappointing that he uses the invented 0.3C figure since I emailed him with this quote from the IPCC only yesterday (in reply to his email asking about the Lindzen non-bet)! Moreover, I'm already betting on a temperature rise of less than 0.26C per decade. It seems like he to wants to bid up the market (invent a straw-man) so as to get a better deal. Wonder why that could be? Ron Bailey also omits to mention the large (and steadily increasing) number of septics who have refused the bet completely. He even suggests that Pat Michaels could pony up for the sceptics. Pat Michaels has already ducked the challenge! Still, all publicity is good publicity, right? I'm certainly not complaining about his headline. Time to look at another prediction from the Foresight Exchange (see here for previous). This time I'll look at global temperature rise - the central question of climate change itself. The GW2030 claim (which I set up) pays $0.01 for each 0.02C by which the globally averaged surface air temperature in 2030 exceeds that in 2000 (using a centred 5-year average at each end). Data is taken from NASA GISS. I chose 30 years so as to be long enough to contain a meaningful anthropogenic warming signal on top of natural variability, but not too long for me to have a hope of finding out the answer. The current market price of $0.40 implies a temperature rise of 0.8C in 30 years - a rate of 0.27C per decade. The last 30 years or so shows a substantially lower trend of 0.17C per decade. I've extrapolated out the trend line to 2030 (result: 0.5C warming) and added two alternative futures of accelerated warming, 0.2C/decade and 0.3C/decade starting at the 2000 temperature. Of course these give 0.6C and 0.9C warming respectively in 30 years. and I'm not aware of any strong evidence to change that much in the forthcoming AR4, Disclaimer: I'm selling on this claim! He still insists he "wouldn't be surprised" if cooling occurs, but declined to make any estimate as to the likelihood of this. Having drawn a blank with B&M's fans, I went back to the horse's arse mouth himself, and looked up Mashnich's email address (can't find Bashkirtsev). But of course, Mashnich won't back his own forecast, which is a pretty good sign as to how much he thinks it's worth. By the way, I have a copy of the B&M paper, and may post a review of it some time. I think that science can and in fact has told us that continued warming is more likely than cooling over the next couple of decades, and offered him 2:1 odds on it. Surprise, he's not interested at any odds. So, that's another 3 septics who loudly proclaim that the scientific consensus (as expressed in the IPCC TAR) is wrong, but are not prepared to bet against it. Funny, that. I'm running out of opponents here. Looks like the first typhoon of the season is on its way, according to this website: Hurricanes, Typhoons & Tropical Cyclones Worldwide (not sure what has happened to their map - looks like someone splashed green paint across it). This was the map as on Saturday lunchtime. Looks like a near miss for us (near Toyko/Yokohama - the southwestern corner of Japan). I find their forecasts to be very good, despite all the disclaimers. Sorry, it's not very readable when scaled for the web page. Last year we had 10 hits on the Japanese main land - killing over 100 people and costing almost $7billion - which is almost double the previous record of 6 hits in a season and three times the average number (there are about 50 years of good records). The long range-forecast for this year is below average, though (I've no idea how accurate this site is - it is just the first thing google threw up). No-one's sure about what sort of influence global warming will have - it seems quite plausible that typhoons will increase in number and magnitude, but it is not certain and the variability is so high that any signal in the data cannot be seen yet. I'm sure it will continue to be a hot topic in climate research for some time. Anyway, by this time jules was doing her best to slide under the table while I was ranting about the presentation of this particular piece of work, which seemed to be deliberately sensationalising the research (I have yet to find any climate scientist who actually admits to believing that there is a significant chance of climate sensitivity being 11C or more, it was merely not ruled out by their preliminary and limited experiment). Fortunately when the journalist got interested and asked if he could quote me I still had sufficient sobriety to point him in the direction of this article on RealClimate which expresses a similar opinion with more authority and clarity than I could hope to. And so to bed...and then a rather subbdued and lazy Friday, with much coffee and an early night tonight, I think. David Bellamy has been asked to stand down as Patron of the Centre for Alternative Technology in Wales. “Over the past three decades, the Centre for Alternative Technology (CAT) has consistently worked to educate the public, on the need for urgent action to combat the consequences of human activity upon our planet. One of the most serious of these effects is climate change. Informed scientific opinion is now firmly of the view that climate change presents a real and serious problem. “Some of Prof Bellamy’s recent published statements seem to be flying in the face of the considered opinion of the majority of the scientific community. Such statements are clearly inconsistent with the standpoint of CAT. Bellamy's latest brainfart was a letter in NewScientist which was neatly taken apart by George Monbiot. The current sunspot cycle is weaker than the preceding cycles, and the next two cycles will be even weaker. Bashkirtsev and Mishnich (2003) expect that the minimum of the secular cycle of solar activity will occur between 2021 and 2026, which will result in the minimum global temperature of the surface air. The shift from warm to cool climate might have already started. So, of course, I emailed him to enquire as to whether he would bet on it. I do not make my own detailed projections. In my paper I referred the reader to B&M paper, and that is all. and said that he would not accept a wager. I am not interested in comparing the strength of your confidence with my confidence. So he joins the hall of shame, along with Lindzen, Michaels, Corbyn, Ebell. I've been playing the Foresight Exchange game for a few months. It's an internet-based "Ideas market" in which players try to increase their "wealth" (sadly, it's only virtual money) by betting against each other on future events. This idea was pioneered by Robin Hanson and I've talked about how I believe it could be a useful addition to the climate change debate elsewhere. Most of the market is politics and technology based, but there are a few environmental issues covered too. Here I'm going to take a quick look at one of them - a prediction of the atmospheric CO2 level in December 2030 (ok, this is really a prediction about human behaviour, technology and politics more than the environment per se, but it has direct environmental relevance). The "claim" pays $0.01 for each ppm by which the atmospheric CO2 level exceeds 400ppm in December 2030 (with a ceiling of $1 for 500ppm or more), so the current mid-market price of $0.675 implies a prediction of 467.5ppm. Note that inflation and discount rates play no part in this market. I've plotted the Mauna Loa CO2 below along with a few projections. The thin green line is an exponential fit to the last 30 years of Mauna Loa data, extrapolated out to 2030. The annual increase in CO2 (currently a little less than 2ppm/year) grows by about 1.4% each year, compounding up to about 438ppm by 2030. These values do change a bit depending on how many years of data are fitted, but still always fall short of the predicted value. The red and cyan lines are projections based on a generous 2ppm/year in 2000, increasing by 2% or 3% per annum thereafter (the data for the 4 years 2000-2004 shows an actual increase of just below 8ppm). As you can see, even the 3% curve falls short of the market's predicted 467.5ppm. Note that these x% projections are NOT simply an x% rise in the atmospheric CO2 level, they are the percentage increase in the size of the annual increase (which is currently running at around 2ppm = 0.5% of the total). So even if this annual increase grows at a rate of 3%, more than double the historical level, the prediction will not be reached. My conclusion is that the claim is significantly overpriced, and that something in the region of 450ppm (=$0.50) or even lower would be much more realistic. Disclaimer: I hold a short position in this claim.